Last evening, I had a very special privilege to talk with ARCA driver Ricky Byers. Our conversation covered his vision of trying to help raise funding to help find the cure for cancer and all his ambitions he has set forth to make this vision a reality. He put everything on the table and spoke with a very heavy heart. Now it’s my job to share with you exactly what his vision involves. Ricky Byers photo taken at Daytona International Speedway. Byers clocked 19th fastest overall. Ricky Byers has raced all of his life. But at the age of 33, his life would change forever. He was diagnosed with Squamous Cell Carcinoma. Squamous Cell Carcinoma (SCC) is the second most common form of nonmelanoma skin cancer following Basal Cell Carcinoma. It had spread into his throat leaving him to battle five years with Laryngeal (Throat) cancer. This is the same form of cancer that claimed the life of Bobby Hamilton, Sr. back on January 7, 2007. But Ricky wouldn’t give in and let the cancer win. In his own right, Ricky turned out to be the winner. Today, Ricky, now 39, is in total remission, 100% cancer free and loving and living life to it’s fullest. You see, Ricky is currently the only two-time cancer survivor trying to accomplish the task of driving in the ARCA ReMax or the NASCAR Camping World Truck Series, and ONLY for a good cause. Ricky’s inspiration and focus had turned towards seven-time Tour De France winner, Lance Armstrong after his diagnosis. Ricky even participated in the Lance Armstrong Foundation Tour of Hope. In helping others, Ricky is there supporting others diagnosed with cancer and making sure they secured financial support, as well as treatment. He used the tools and resources available through Lance’s web site, knowing he had a fighting chance to beat this ‘monster’. Ricky is hoping that some day he will have the chance to meet Lance Armstrong. In the meantime, he stays strong by helping the cause and bringing forward awareness to this dreadful disease. Ricky Byers getting ready for the ARCA test session. 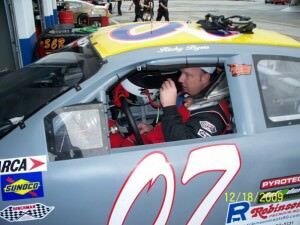 Ricky’s goal for 2010 is to be a full time driver in the ARCA ReMax Series or even the NASCAR Camping World Truck Series in order to raise money for cancer research. Plain and simple. He wants to share his dream and belief, that cancer can – and will be – a thing of the past. 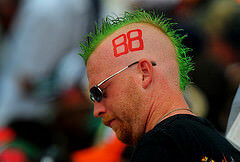 He hopes that his ‘Racing for a Cure’ will start at Daytona this coming February. 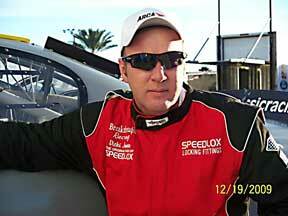 He completed a couple of days of testing at Daytona in mid-December and had the 19th fastest overall time. 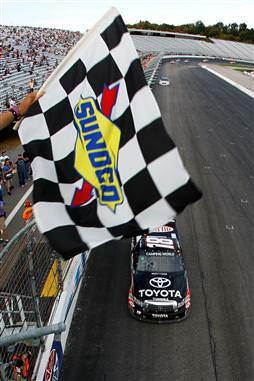 He did have a fastest lap that placed him 12th fastest at one point. 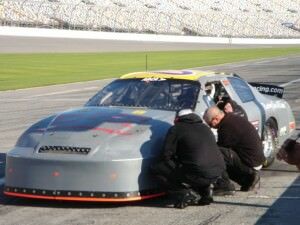 Ricky Byers Racing during ARCA testing at Daytona International Speedway. The sad part of this whole story, is that I see the lack of interest the media is portraying towards this cause. At the same time Danica Patrick was testing her ARCA car at Daytona International Speedway, Ricky was there testing, but was never approached by the media about what he is trying to do. I guess Danica is more important. 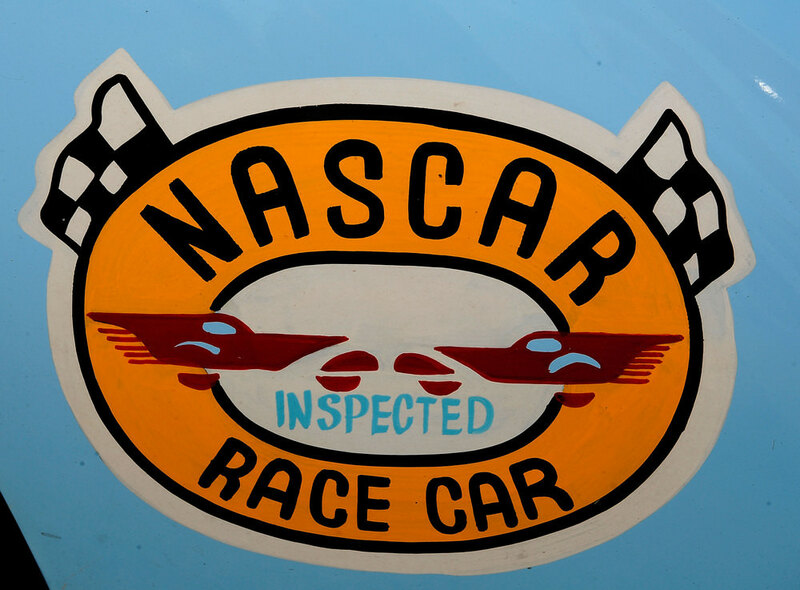 By the way, just a heads up to potential sponsors…..Ricky ran faster than Danica. 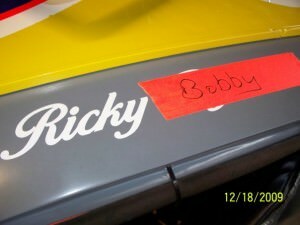 Currently, Ricky’s Racing for Cure has been sidelined due to non (monetary) sponsorship. Humor has found it’s way in. RBR is currently asking for $2.2 Million for sponsorship for the whole ARCA or NCWTS season, which compared to a normal NASCAR Sprint Cup race team (asking price for sponsorship usually runs between $15 -$20 Million for a season) – $2.2 Million should be easy to come by. “Someone or some company is out there somewhere that would very simply agree that this is for a good cause and hopefully will come forward,” Ricky said. I asked him what that $2.2 Million would cover and he answered that it would be just enough to get the job done….it would allow him to race, have a show car to aide the fundraising and cancer awareness at the tracks, hauler and car wraps and travel expenses. That’s it. Ricky mentioned this is pretty much a no-brainer, and I totally agree with him. A sponsor comes forward, Ricky races, and all the money he earns will be donated to cancer research facilities with one stipulation: 100% of the funds must go into the research itself and not payrolls. He’s been trying to get a hold of the Victory Junction Gang Camp and would like to help them as well, but no phone calls have been returned to Ricky as of yet…. and, unfortunately, it’s been a while. He’s also in the process of trying to reach Walt Disney World (Corporate) to see if they would be interested in supporting Racing for a Cure since Walt Disney’s nephew, Roy Disney, Jr. just recently passed from stomach cancer. “They certainly got enough of my money over the years,” Byers said. Due to his Laryngeal cancer, Ricky has lost a vocal chord and has a very deep-graspy voice. “Sometimes people don’t call me back because it’s so hard to understand me,” said Ricky. Well, I gotta tell you, I didn’t have a hard time understanding him during our conversation, so please don’t use that as an excuse not to call or to talk to Ricky!!! Currently, Ricky is on-air with a regular syndicated radio and internet talk shows (Burning Rubber Radio) trying to bring awareness to Ricky Byers Racing and his Racing for a Cure. He has a Ricky Byers Fan Page on Facebook. He also writes his own blog on a site named NASCAR Ranting & Raving. You could find his blog under “Ricky’s Articles.” Here you can follow Ricky on his journey of trying to make his vision come through fruition.